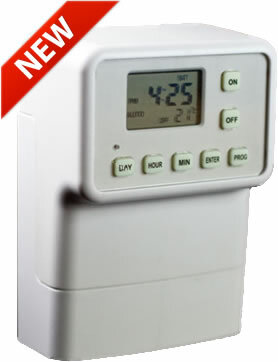 Fitted in under one minute, without any wiring to install, the easy to use light switch timer turns your standard light switch into a reliable, functional timer. Burglars are most likely to strike when you are out. Being able to tell whether you are at home or not is the unfortunate signs burglars use to target a home, with 4 out of 5 burglaries occurring without the home owner present. With a light switch timer on your main lighting at home, this can decrease the likelihood of potential break-ins. The battery powered program can be a real safety bonus for your home. Leaving your home alone in the dark during the winter months can attract burglars, with them thinking that nobody is home. Having your lights switched on automatically with the light switch timer makes your home look occupied and somebody present. Leaving your home empty? Making it a potential burglary target? The Light Switch Timer adds the extra level of security. With over 30,000 tested on/off cycles without any failure. It is designed to replicate a human finger, battery powered timer rolls over the switch to turn on or off. It can be installed on a standard 1, 2 or 3 gang switch plate and works with all types of bulbs, including LED's and energy savers. You can still manually turn your lights on or off with the buttons provided or you can remove the unit from its cradle and have access to the switches themselves. See the video below on how the Light Switch Timer is installed under a minute.